Getting the hang of a baitcasting reel seems daunting to a lot of anglers trying to break into that niche of the fishing world. In all honesty, with a little practice, you will find that it is not all that difficult to become proficient at. There are factors that will cut down on time to get over the learning curve, and one of those factors is the type of line you are spooling onto your reel. Here, we will outline the best line for baitcast reels. There are hundreds and hundreds of fishing line options, but not all of them are going to serve you well when used on a baitcasting reel or can be called the best line for baitcast reel models. In this article, we will take a look at the different types of fishing line, and the features of these lines to either do or don’t work well with a baitcasting reel. We will then take a look at four brands of fishing line that matches well with a baitcaster and will make fishing much smoother on the water. Finally, we will make our pick for the best line for baitcasting reels. There are various lb test options available for this line ranging from 6 to 50lb test so there is a spool of this stuff available for just about any game fish that you can catch. This line incorporates all of the benefits of braided line and also brings in the low visibility of fluorocarbon. With this type of line, you can use your braid in clear water conditions without the need to use fluorocarbon leaders which reduces a number of weak points and potential break points between the fish and you. This braided line competes with the best fluorocarbon on the market regarding low visibility. This line has incredible high strength to diameter rating which means you can spool an incredible amount of line with higher lb test than normally achievable. It’s a very powerful line with eight strands woven together. You will also find that this line has very minimal to no memory. It has very little friction for braided line and does an incredible job coming off of the reel giving you excellent casting performance. This line, as braid often does, tends to fray when used around heavy structure. This line might fray a bit easier than other braided lines, and you might be better served with a more fray resistant braid if you are going to be pulling lures through the brush and rocks. 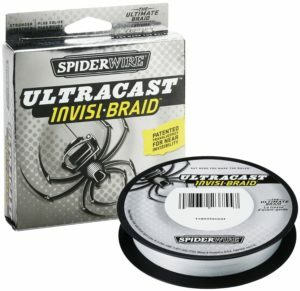 The Spiderwire Ultracast is a bit pricier than other braided lines, but the addition of low visibility in the water is a quality that is hard to put a price on in certain fishing situations. A baitcaster spooled with this stuff in clear water or more finesse fishing situations is a deadly combo. You have a huge option of line strengths and dyes for this braided line letting you match the line with the fish and water you plan to be on. This is a fantastic braided line and a lot of experienced anglers will tell you that this is the best line baitcaster reel spools and for good reason, as you will see. What we really like about this particular braided fishing line and what separates it from other lines is the knot strength. The non-wax coating that is used on this line is what allows better knot use, a lot of anglers have even found that knots normally avoided when using braid, such as a clinch knot can be utilized. 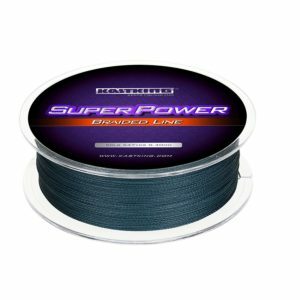 This same coating used in KastKing’s Super Power Braided Line cuts down drastically on line friction between the line on the spool as well as through the rods guides. You will be able to notice this with the superior casting of this braid. Like most braided fishing line, the KastKing Super Power has extremely low memory. This helps tremendously with lure presentation and retrieval as well as casting. You can spool this onto your baitcaster and continue to have excellent casting performance after several weeks of hard use. The bane of braided line and what all anglers hate to notice is fraying of the line. This often means a huge reduction in the lines strength and the inevitable time spent on gear upkeep. This braided line from KastKing features excellent abrasion resistance when compared to other braided line products from competitors. If you have used other braided lines, you will notice quickly at how well this line does when used in high abrasion areas. Like all fluorocarbon line, this is invisible to fish in the water and makes an excellent choice for a leader with both braided line and monofilament as it also has tremendous knot strength. This Red Label Fluorocarbon is nearly invisible to the fish when submerged and can be used in extremely clear water conditions with line wary fish. You will also notice after several uses of this line that it is extremely resistant to deterioration that is often seen with other fluorocarbon lines. It’s incredible abrasion resistance is one reason for this quality, but it’s chemical treatments also make it resistant to UV and water damage that often causes fishing line to lose its strength. This line is more suited as a leader material more so than spooling your entire line. It has quite a bit of line memory compared to other fluorocarbon products so spooling the entire line can be troublesome. For fluorocarbon, this has a small diameter, which is going to help with reducing friction and it also allows you to spool more of the stuff if you are so inclined. 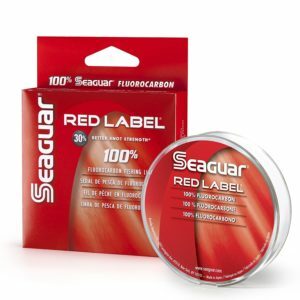 If you are going to use the Seaguar Red Label as a leader material, it’s a really great price for the amount of line you are going to get out of the spool. This is some of our favorite monofilament that is on the market and we think is one of the few monofilament brands that we enjoy spooling onto our baitcasters. Only taking into account monofilament products, this is easily the best line for baitcaster reel fishing. There are numerous line colors that are available, including a crystal clear product, and line lb test options ranging from 4 to 30lbs. This is a powerful monofilament that has a much smaller diameter than other similar lines. This is great for a baitcaster and doesn’t hinder casting performance as other monofilament lines often do. Another feature of the KastKing Masters Tournament that adds to casting performance, especially on a baitcaster, is the low line memory. For monofilament, it’s pretty spectacular and is going to help line fly off a baitcaster much easier as well as improve lure presentation. This line also has more limited stretch than other monofilament lines. This can be a pro or con depending on the fishing application. The stretch is still there but think of it as in between common monofilament and braided line. It has excellent knot strength and better than decent environmental resistance, including UV and water damage that usually effects monofilament. In all honesty, it’s very difficult to find a major problem with this line. Before we leave you to getting on the water, we want to take one of the four lines discussed in this article and peg one as the best fishing line for baitcaster fishing. 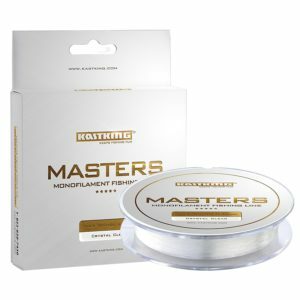 While each type of line has it’s specific fishing niches that it will excel in, we feel that the KastKing Masters Tournament Grade Monofilament deserves the title of best fishing line for your baitcaster. Compared to other lines, it is extremely affordable and seems to fall more in a category between monofilament and braided line regarding fishing properties. It is strong, resistant to deterioration, much more sensitive than other monofilament lines. For monofilament, it also has a much smaller diameter and less spool memory, which makes it excellent for baitcasting applications. Baitcasters are an incredible tool at the disposal of serious anglers and opens up the fishing world for various fishing techniques and lure uses that are not possible with other types of reels. Having the right type of fishing line to match the fishing situation you are in is critical to consistent success. In this article, we have proposed four different fishing lines, of various types, that we know pair well with a baitcasting reel and will perform on the water and all have the potential to become the best line for baitcast reels in your eyes. Let’s first take a look at the three most popular types of lines that are most often used on baitcasting reels. We will quickly review the benefits and drawbacks of these three popular types of line and under which situations that are most often used. All three are commonly used with baitcasting reels and all have products that can easily be called the best line for baitcasting reels. Monofilament: The first plus to using monofilament is that it is the cheapest of the three options we will outline here. The biggest characteristic of monofilament is the stretch properties of the line. This can be a pro or con depending on the type of lures and fishing techniques you are using. This stretch is a little more forgiving when it comes to hook sets, so your not as likely to jerk the lure out of a fish’s mouth when it is gently hitting the bait. Because of this stretch, it’s not near as sensitive as braided line but is sensitive enough for most fishing applications. Monofilament also tends to have line memory, meaning after being in a certain shape for an extended period or time, such as wrapped around a spool, will take that shape and can hurt casting performance. Another positive to monofilament is that just about any fishing knot can be used, and mono will hold knots extremely well. Fluorocarbon: You will rarely find anglers using a full spool of fluorocarbon fishing line. Instead, this type of line is often used as a leader. A short piece of fluorocarbon is tied to the main fishing line, either mono or braid. The reason for this and most often the reason fluorocarbon is used is because of the low visibility in the water. Fluorocarbon is a dense material that has a similar refractive index as water which means it reflects light in the same way as water and makes it nearly invisible in the water. When finesse fishing in clear water, fluorocarbon is a huge game changer. Fluorocarbon has less line memory and less stretch than monofilament which is a plus to a lot of anglers. Because fluorocarbon is denser, it is also used for fishing with lures that need to get deep. Braid: Most anglers are probably under the impression that braid is one of the newer forms of fishing line while it is actually one of the oldest. What has changed is the material used in the braid and the technologies that have gone into coloring, wrapping, and coating to give these type of lines incredible properties. Braided line is often regarded as the best line for baitcaster fishing, but you still have to pick the right type of braid. Braided fishing line is made from several single strands of high molecular weight polyethylene that are then weaved together and is what gives braided line its incredible strength. Unlike monofilament, braided line has minimal to zero stretch properties which make it an extremely sensitive line and allows you to detect bottom structure and slight takes of the lure. Over time, the braid will begin to fray, especially if used around rough structures such as sunken brush or rocks. This fraying will cause the line to lose its strength, and you will begin to have a higher chance for line breaks at the worst possible moments. It’s easy to see the fraying and when it is substantial, simply remove the frayed portion of the line or re-spool. One of the biggest cons to using braid is its opaqueness. Braid is highly visible in the water and might not be the best choice for use in clear waters or line shy fish. You also need to be wary of the types of knots that you tie when using braid. Braid does not grip as well as mono or fluoro, and certain knots will not hold well with braid. This is also the reason why many anglers will use a mono backing when spooling with braid on their baitcasters. The diameter of the line can have an effect on casting performance. The larger the diameter, the more friction is generated when line is pulled off the spool. As you can imagine, more friction means less distance on the cast. Line diameter also makes a difference in the water. Again, more surface area means more water resistance. When fishing for wary fish, this water resistance might cause more disturbance in the water that will keep fish from coming in the last few inches to take the bait. As line strength goes up, the diameter often does as well. One reason why braid is so popular is that the line diameters are often much smaller while maintaining line strength. For monofilament and fluorocarbon, the color is not much of an issue although there are more options for colored monofilament. Braided line often comes in a variety of colors. Without the added color, braided line would be highly visible. By coloring the line, you can match line color with water conditions to try and camouflage the line. So the question is how do you choose which color of braid? Neutral colors such as olives and grays are good choices for most lakes where they can blend in with the water and natural vegetation. Highly visible colors also have their advantages. You can easily tell where your lure is and how it is behaving with these colored lines. Adding a fluorocarbon leader will help keep from spooking fish. The pound test of line tells you how much pressure the line can withstand before breaking. Obviously, the type of line test you will want for your reel is going to depend on the type of fishing you are taking part in. 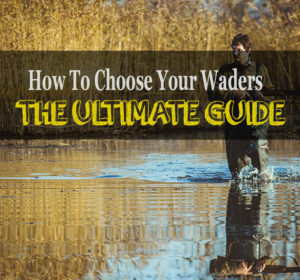 When comparing the three different types of lines, you will find that braid has a much smaller diameter than monofilament and fluorocarbon while maintaining the same strength, so you will be able to spool more of it. No matter what type of line you go with, after a certain amount of time it’s going to be critical to re-spool your reel. Braided line will begin to fray and dull while monofilament and fluorocarbon will eventually begin to breakdown from UV and weathering. Because of this, it is important to pay attention to how long it normally takes for certain lines to begin this process so you do not end up with a trophy fish breaking off and it could have been avoided. The best line for baitcaster reels is going to need to be re-placed less often. Now that you have been refreshed on the various types of lines let’s discuss what exactly baitcasting reels are designed for. With this is mind we can narrow down our options as to the best lines to spool onto your baitcaster. Baitcasting reels are designed in a way to get heavier lures out at increased distances with much better control and accuracy than other types of rod/reel combos. With the mechanics behind baitcasters, they also work better with heavier lines. The conditions you are in, the weight of the lure, and tension adjustments can all affect the lines casting performance. While a baitcaster can be spooled with any fishing line that we have discussed so far, many anglers prefer to use braid or fluorocarbon over monofilament. With the line memory of monofilament, it will not take long until the changes in the lines shape are going to start reducing the casting performance. Nice article. I’d like to see more about that invisi-braid but a lot of amazon reviews say it’s pretty brittle. Could be the best of both worlds though if you get the right weight. Shore fishing with long casts braid with a 5ft flouro leader is the way to go. Seems like I catch more fish with mono though and you can not beat the price… so cheap its almost free.